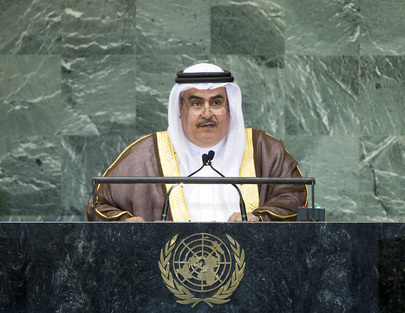 KHALID BIN AHMED BIN MOHAMMED AL KHALIFA, Foreign Minister of Bahrain, said that, since 2011, serious challenges to his country’s security and stability had arisen. The Government had created the Bahraini Independent Commission of Investigation “to establish the truth and give each person his or her due”. King Hamad bin Issa Al Khalifa had also proposed the creation of an Arab court of human rights to lay down the foundations of an enabling environment for human rights and to protect those rights in the Arab world. It would be modelled on the Inter-America Court of Human Rights, the European Court of Human Rights and the African Court on Human and Peoples’ Rights. The Council of the Arab League had endorsed that historic initiative and arrangements were currently under way to set forth the legal basis for establishing the court, which hopefully would become a reality very soon. The United Nations had an indispensible role in addressing international and regional problems and finding appropriate solutions, he said. The Arab world was now in great need of that role, given the speedy and regrettable developments in Syria. The international community, represented in the United Nations and its entities, entrusted with maintaining international peace and security, was called upon to unify its position and end the suffering of the Syrian people, and to find a political solution to the crisis that would bring an end to the violence and bloodshed. The Organization must, therefore, shoulder its responsibility to protect unarmed civilians and not allow its own procedures to impede its ability to prevent crimes against humanity, he emphasized. Even though the Syrian crisis was currently the international community’s main concern, the Palestinian question remained the core issue in the Middle East, he said. It was imperative to redouble efforts for a just, durable and comprehensive solution, notably through the creation of an independent Palestinian State with East Jerusalem as its capital, in conformity with the relevant resolutions of the United Nations, the Arab Peace Initiative and the decisions of the Middle East Quartet. The international community should, therefore, demand that Israel halt its settlement-construction which was jeopardizing the chances for peace. He also stressed the necessity of implementing General Assembly and Security Council resolutions by taking practical action to halt Israeli violations and aggression and ensure its observance of the principles of international legitimacy. Israel should also adhere to the Treaty on Non-Proliferation of Nuclear Weapons and subject its nuclear facilities to IAEA inspection, he continued. On the other hand, Iran must fulfil its commitment to total and transparent cooperation with the Agency, he stressed. That country had lately been reiterating menacing threats aimed at members of the Gulf Cooperation Council, contradicting the spirit of good-neighbourliness, and thereby generating tensions and suspicions in the region. More importantly, Bahrain reaffirmed the necessity of resolving the problem of the three United Arab Emirates islands occupied by Iran — of Abu Musa, Greater Tunb and Lesser Tunb — either through direct negotiations or arbitration by the International Court of Justice.